HIV/HCV co-infection is characterised by accelerated progression of liver disease. Recently, the rsl2979860 C/T polymorphism in the IL28B gene has been linked to progression towards cirrhosis in HCV mono-infected patients and to treatment response of HCV-infection in HIV/HCV co-infected patients. Our aim was to clarify by non-invasive techniques if this polymorphism affects fibrosis progression in HIV/HCV co-infection. In a cross-sectional design, liver stiffness (transient elastography), surrogate markers of liver fibrosis (APRI and FIB-4 scores) and rsl2979860 genotypes were analysed in 84 HCV/H1V co-infected patients. IL28B genotypes were determined by real-time PCR using a light cycler. In 56 HIV/HCV co-infected patients we also studied progression of fibrosis in relation to rsl2979860 C/T genotypes over two years. 82% of the patients were on HAART (74% without detectable HI viremia) and 67% were haemophiliacs, respectively. HCV genotype 1 was present in 62%. Cross-sectional median liver stiffness was 7.4 kPa and correlated with APRI and FIB-4 scores (r = 0.6 each, p < 0.001). Frequencies of IL28B genotypes were: CC 50%, CT 43% and TT 7%. In the cross-sectional analysis liver stiffness values were not different between the various IL28B-genotypes. Upon follow-up under HAART carriers of a C allele did not show further progression, while liver stiffness significantly increased in HIV/HCV co-infected patients with the T allele (p = 0.047). Although progression of liver fibrosis was low under HAART in our cohort, progression was more pronounced in HIV/HCV genotype 1 co-infected patients with the T allele. Liver disease is the main cause of mortality in about 10 per cent of HIV infected patients in Germany . To a large degree, liver disease among HIV patients is caused by chronic HCV infection, because both viruses share similar ways of transmission . Treatment of HCV infection is difficult in HIV/HCV co-infected patients, as immunological dysfunctions still persist under HAART . Data on the progression of liver fibrosis in HIV/HCV co-infected patients in the HAART era are contradictory, ranging from rapid progression to advanced fibrosis in some cohorts [4, 5] and to outcomes similar to HCV mono-infection [6, 7]. 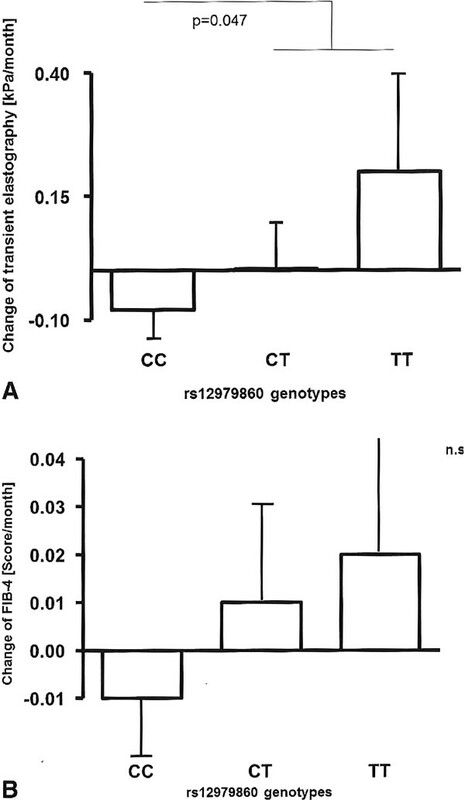 Recently, polymorphisms in the IL28B gene have been linked to spontaneous clearance of hepatitis C . Although the T allele of the rsl28979860 IL28B polymorphism has been reported to be more frequent in HCV infected patients with liver cirrhosis than in healthy controls or patients with cirrhosis of non-viral origin , it is not known whether genetic variation in the IL28B gene also affects progression of liver fibrosis in HIV/HCV co-infected patients. Assessing liver fibrosis is difficult in HIV/HCV co-infected patients because liver biopsy, the current diagnostic gold standard, is limited by small sample size, poor patient acceptance and the risk of possibly life-threatening complications . Transient elastography is a non-invasive method to measure liver stiffness, which has been evaluated with good results in HIV/HCV co-infected patients [11, 12]. As an alternative, certain serum markers have been proposed to indirectly reflect the degree of liver fibrosis. In particular, APRI  and FIB-4  scores, which rely on standard laboratory values, have been established as surrogate markers for liver fibrosis. Using transient elastography, APRI and FIB-4 scores as surrogate markers of liver fibrosis, we studied the effect of the rsl2979860 C/T polymorphism approximately 3000 base pairs upstream of the IL28B gene on progression of liver fibrosis in HIV/HCV co-infected patients. We analysed in a cross-sectional design all 84 patients with HIV/HCV-co-infection whose DNA was available for genotyping of the IL28B-SNP and who had at least one valid assessment of liver fibrosis by transient elastography between January 2005 and February 2009. To assess progression of liver fibrosis, we studied all the 56 H1V/HCV co-infected patients from the above-mentioned cohort who had received at least two follow-up assessments of liver fibrosis till September 2010. Informed consent was obtained prior to the study, and the protocol had been approved by our local ethics committee in accordance with the Declaration of Helsinki. Demographical and clinical data as age, gender and medication were recorded in all patients. Parts of the clinical data of our patients were published previously in studies on the evaluation of transient elastography [15, 16]. Detection of HCV and HIV antibodies, determination of HCV and HIV viral loads as well as CD4 counts, liver function tests and platelets counts were done by routine procedures . The AST to platelet ratio index [APRI] and F1B-4 scores were calculated as published [13, 14]. We genotyped all patients for the IL28B rsl2979860 SNP with the commercially available Light SNIP rsl2979860 hu IL28B assay (TIB MOLBIOL, Berlin, Germany). In transient elastography the tip of the transducer is placed on the skin between the rip bones over the right lobe of the liver, so that an elastic shear wave is propagated through the tissue. The velocity of this wave, which is directly related to tissue stiffness, is measured by ultrasound. The tissue covered by this measurement corresponds to a volume of about 1 cm width and 4 cm length, in a depth between 25 mm and 65 mm below the skin. Results are expressed as median stiffness (kPa) of at least ten measurements. Patients in whom it was not possible to obtain a minimum of 10 measurements with a success rate of at least 60% and an interquartile range of less than 30% of the median were excluded . Statistical analysis was done with SPSS release 17.0 (SPSS, Munich, Germany). Data are given as means ± standard deviation, unless stated otherwise. Quantitative data were analysed using the Mann-Wliitney-U test, the Wilcoxon-signed-rank test or the Kruskal-Wallis test, as appropriate. Fisher's exact test was used for qualitative data. Correlation was done using Spearman's rank correlation. As the frequency of the TT gehotype of the rsl2979860 polymorphism is low and a recessive effect of C allele was proposed before (8, 20 - 22), we combined the CT and TT genotype for comparison with the CC genotype when a difference was found. 76 (90%) patients were male with a median age of 43 years, 56 (67%) had haemophilia. 52 (62%) of the patients were co-infected with HCV genotype 1, 67 (82%) received HAART and HI vircmia was below the level of detection in 62 (74%) patients. Median liver stiffness (transient elastography) was 7.4 kPa. Median APRI and FIB-4 scores were 0.9 and 1.6, respectively. The distribution of IL28B rsl2979860 genotypes (CC in 42 (50%), CT in 36 (43%) and TT in 6 (7%) patients) was in accordance with the Hardy-Weinberg equilibrium. Further patient details as well as separate information on the subgroup of the longitudinal analysis are summarised in Table 1. As expected APRI and FIB-4 scores correlated significantly with the results obtained by transient elastography (r = 0.6 for both, p < 0.001). However, we could not find any significant correlation between liver fibrosis and rsl2979860 genotypes irrespective of the choice of surrogate markers (Table 2). There was also no significant difference in liver stiffness levels with respect to different HCV genotypes. Since the rsl2979860 C/T polymorphism has predominantly been described in patients with HCV genotype 1, we analysed this subgroup separately, but could not find any effect. However, CD4 cell counts differed significantly between IL28B-genotypes, being lowest in homozygous carriers of T alleles. Differences between patients with rs12979860 C/T genotypes in the cross-sectional analysis. Next, we hypothesized that progression rates were affected by the IL28B polymorphism. This patient subgroup corresponded closely to the entire study group (Table 1) with a baseline liver stiffness of 7.8 kPa, which was significantly correlated to APRI score (median 1.1; r = 0.6, p < 0.01) and FIB-4 score (median 1.6; r = 0.7, p < 0.001). Median follow-up was 25 months (range 5 50 months). Overall, changes in liver fibrosis were rather low (Δ liver stiffness: 1.3 kPa ± 8.3 kPa, ΔΔPRI = 0.9 ± 6.2, ΔFIB-4 = -0.6 ± 7.0) and these differences did not achieve statistical significance, but still revealed a significant correlation of Δliver stiffness versus ΔΔPRI or ΔFIB-4 score (r = 0.4 each, p = 0.004 and p = 0.002 respectively). Considering all HCV genotypes together there was no variation in fibrosis progression between the different IL28B genotypes. However, a subgroup analysis in our HCV genotype 1 co-infected patients revealed a slight decrease in liver stiffness in rsl2979860 genotype CC patients, no change in heterozygous C carriers and a slight increase in genotype TT patients (Figure 1). This effect achieved statistical significance when carriers of the T allele were compared to patients with the CC genotype (p = 0.047, Table 3). Similar to liver stiffness, changes in FIB-4, but not in APRI scores, revealed a gradual increase in relation to the number of T alleles (p = not significant). There was no significant difference in control of HI viremia or CD4 counts between these groups. Different rates of liver fibrosis progression in patients co-infected with HVI and HCV genotype 1 depending on the IL28B genotype (error bar = standard error). A Evaluation by transient elastography, p = 0.047 for CC versus T allele. B Evaluation by FIB-4 scores, p = not significant for CC versus T allele. Changes in surrogate markers of liver fibrosis in HIV/HCV infection in the longitudinal analysis. In this cohort of HIV/MCV co-infected patients with a high proportion of haemophiliacs we analysed the relationship between the rsl2979860 C/T polymorphism in the IL28B gene and progression of liver fibrosis applying both a cross-sectional comparison and a longitudinal study over 25 months. In the cross-sectional analysis, we could not find any correlation between surrogate markers of liver fibrosis and genotypes in the IL28B gene. However, we observed a significantly higher progression rate of liver fibrosis in the follow-up of patients infected by HCV genotype 1, who carried a T allele. This observation is in line with a previous study on HCV mono-infected patients in the context of liver transplantation [9j, which reported a higher T allele frequency in patients with viral cirrhosis compared to patients with cirrhosis of non-viral origin or healthy controls. Thus, our data now provide first evidence that also HIV-positive patients with HCV genotype 1 co-infection show different rates of liver fibrosis progression depending on IL28B genotypes. The fact that we observed an effect only in the follow-up group but not in the cross-sectional study quite likely reflects that fibrosis progression is determined by various factors such as different duration of viral infection and quality of HIV control. These factors may have been better controlled for in the follow-up study. As patients with a T allele showed a trend towards a longer observation period, we standardised fibrosis progression rates to the time of the follow-up. Normalized rates of changes in liver stiffness confirmed the negative effect of the rsl2979860 T allele. An unexpected finding was the apparent association between IL28B genotypes and CD4 counts. This relationship remains unexplained at present. Leukopenia is associated with advanced liver disease. However, the absence of any association between the IL28B alleles and liver stiffness makes it an unlikely cause for this CD4 relationship. Alternatively serum levels of lambda interferons, which are coded for in the region of the rsl2979860 C/T polymorphism, may be higher in carriers of the C allele, thus possibly contributing to better antiviral control both in HIV and HCV infection [18, 19]. Initially, an association between the rsl2979860 C/T-polymorphism and response to standard treatment in HCV mono-infected patients was reported for HCV genotype 1 . It is not clear in how far this polymorphism predicts definitive treatment response in HCV genotype 2 and 3 [21, 22]. The association between rsl2979860 polymorphism and treatment response was also only confirmed for genotypes 1 and 4 in HCV/HIV co-infected patients while data are contradictory for genotype 2 and 3 [23, 24]. This may explain why we observed an effect only in patients with HCV genotype 1. Another explanation might be the relatively low number of patients infected with other HCV genotypes in our cohort. Beyond that, we confirmed in our HIV/HCV co-infected patients that IL28B allele frequency differs between patients infected by different HCV genotypes , since a CC frequency of 39% was found in HCV genotype 1 infection versus 74% in HCV genotype non-1 infections (p = 0.006). So far, the molecular effect of the IL28B mutation on HCV replication has not been established. A reduced hepatic expression of interferon-stimulated genes in the favourable genotype  was reported, but another group found no direct influence of IL28B mutations on the expression of interferon-stimulated genes . Still, contradictory findings could be explained by different effects of IL28B genotypes on gene expression in different intrahepatic cell populations . Thus, the rsl2979860 polymorphism could influence liver fibrosis progression via differential expression of interferon-stimulated genes. Another possible mechanism could involve upregulation of CXCL9 in the CC-genotype of the rsl2979860 polymorphism . CXCL9 has been found to have anti-fibrotic properties . Unfortunately this study has a couple of limitations. The cross-sectional study was done retrospectively and the cohort is rather small with only two years of follow-up. Although differences in probe position, different operator experience and low grade of fibrosis may have resulted in variability of transient elastography measurements , several studies confirm good reproducibility of transient elastography [31, 32]. Nevertheless, transient elastography can be limited by liver steatosis, a common problem in HIV/HCV co-infected patients . However, in contrast to HCV mono-infected patients or acute viral hepatitis, chronic inflammation does not seem to interfere with transient elastography in HIV/HCV co-infected patients . The high proportion of haemophiliacs might be advantageous to study genetic host factors, because they are less exposed to potentially confounding factors such as hepatotoxic agents, which must for example be considered in i. v. drug injecting patients. It was also a particular strength of our study that results were obtained from a follow-up which provided a defined reference frame for interpreting fibrosis progression. Concerning serum markers of liver fibrosis APRI or FIB-4 scores, effects due to the IL28B polymorphism were seen only with respect to FIB-4 score. This discrepancy can be attributed to the fact that the errors in measuring each single score component may have added up unfavourably, so that total variability of APRI and FIB-4 scores may have exceeded the effect, in the face of an overall low fibrosis progression in our cohort. In addition to adherence to HAART  and CD4 counts , differences in distribution of IL28B alleles might explain divergent rates of liver fibrosis progression in cohorts of HIV/HCV co-infected patients. Carriers of the rsl2979860 TT genotype infected with HIV and HCV genotype 1 could be at a high risk for end stage liver disease. A long-term prospective study is warranted to confirm the long-term impact of IL28B alleles on the outcome of HCV co-infection in HIV-positive patients.